The Union Square Greenmarket is held Mondays, Wednesdays, Fridays, and Saturdays between 8 AM and 6 PM year-round. The market is served by a number of regional farmers, as the average distance between farmers and the market is 90 miles. More than one thousand varieties of fruits and vegetables can be found at the Greenmarket and the variety of produce available is much broader than what is found in a conventional supermarket. Union Square is also known for the Union Square Holiday Market, which is held November 23 through December 24. Temporary booths are filled with over 100 craftsmen, who sell items ranging from candles and perfume to knitted scarves and high-end jewelry. In 1976, the Council on the Environment of New York City (now GrowNYC) established the Greenmarket program, which provided regional small family farmers with opportunities to sell their fruits, vegetables and other farm products at open-air markets in the city. 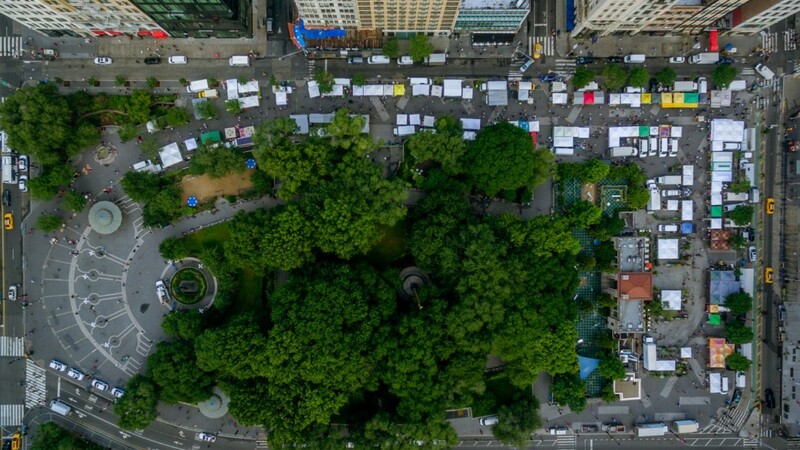 Today, the Union Square Greenmarket – the best-known of the markets – serves more than 250,000 customers per week. Made in Philadelphia. © 2019 Zeckendorf Towers. All rights reserved.